Punch Tools has developed a wide variety of specialized industry knowledge while working within the windows and doors industry. 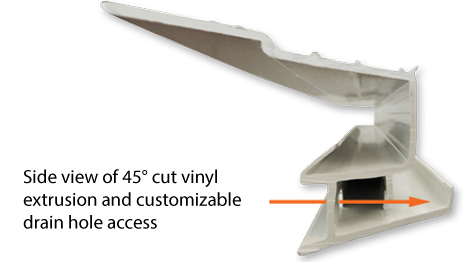 Our experiences have lead us to have a strong understanding of drain holes and screw chaser placement on difficult locations, angles or intricate window extrusions. 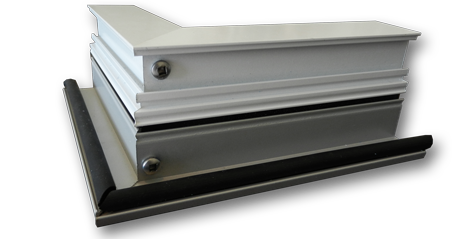 Need a design for: interior or exterior drain / weep hole placement, multiple drainage holes, aluminum or vinyl extrusions. We can make the perfect custom solution to fit your project. We are able to punch through multiple internal walls on your plastic or aluminum extrusions to created the desired drain holes and deadbolt knockouts. 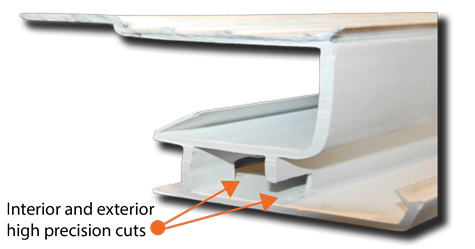 Above: an example of the process a single piece of window industry plastic extrusion may go through to achieve its desired interior and exterior drain holes. 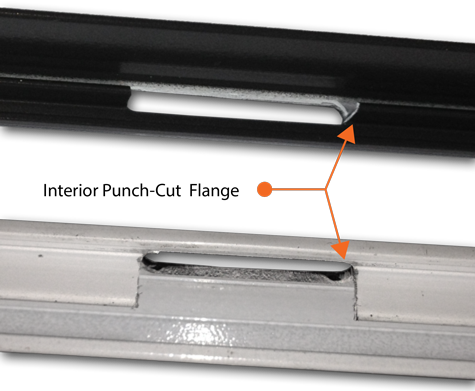 A 45 degree cut piece of window industry vinyl extrusion, highlighting the varied placement of drain holes available on either the interior or exterior walls. Alternate view of the window industry vinyl extrusion. The screw chaser holes punched into this piece of aluminum framing extrusion have been punched through to mate perfectly with the frame extrusions interior screw chaser channel. 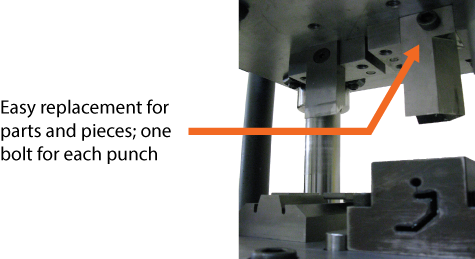 Our custom punching presses can be designed to match any screw chaser or drain hole locations on either aluminum or vinyl window extrusion frames to fit your designs. Joining together the two pieces on 45 degree angle cuts, the screw chasers pull together the extrusions for a perfect and hassle finished frame. Above: The challenge for this project was to punch a drain hole and take out the flanges below in one hit with no distortion left behind on the aluminum extrusion piece. Above: A custom punch stations designed for this aluminum extrusion project with an implemented Razor / Tiger Stop guide for precise punch placement. 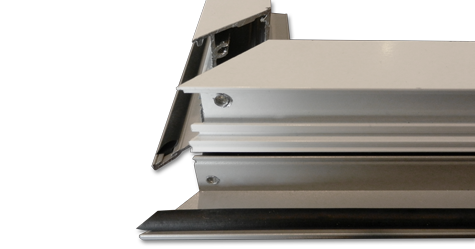 The punch above produces a cover mating pair cut on an aluminum extrusion muntin (seen in the image below). An exploded view of one of our stand alone hydraulic punching press stations. Overview of the punch station in multiple views.